Yep, you might’ve noticed that I’ve been ever-so-slightly obsessed with banners these days. I just can’t help it! Ever since I created my “Celebrate! Banner” pattern last year, I’ve been making every possible type of bunting, both for me and to give to loved ones. 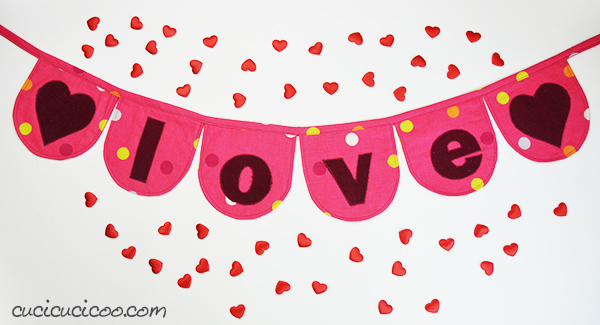 I made this Love Banner for a friend who had suffered multiple miscarriages to remind her of the love in her family (she is now expecting twins, yay!). 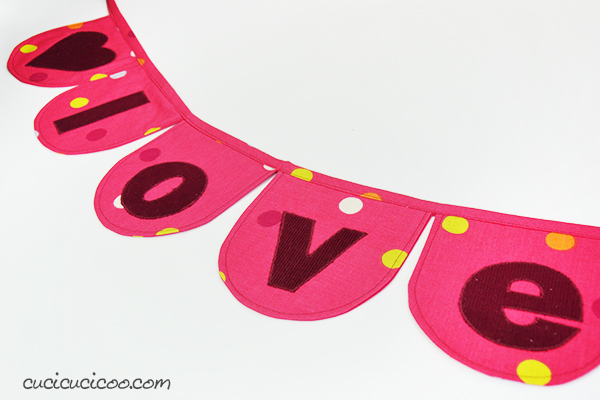 I sewed it this last summer, but waited until now to share how to sew a fabric Valentine’s Day banner. I honestly don’t really like Valentine’s Day that much because I believe that we should express our love for others every day of the year, not on some random day on the calendar. And what better way to be grateful of our fortune in having loved ones than having a colorful banner to remind us every day? Or, if you are a V-Day person, just hang it up that time of year. It’s your call! 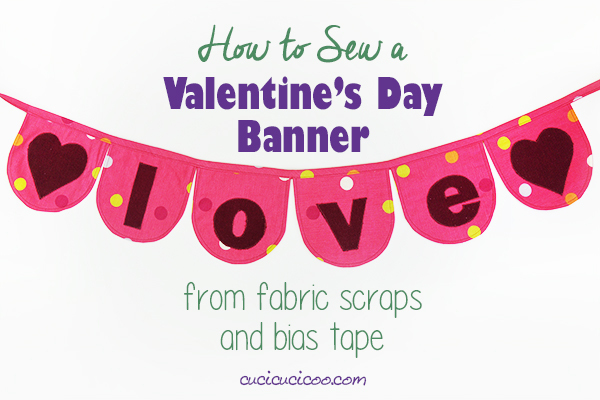 So, are you ready to learn how to sew a fabric Valentine’s Day banner? Let’s get started! Fabric yardage or scraps. I used scraps from other projects for this banner. 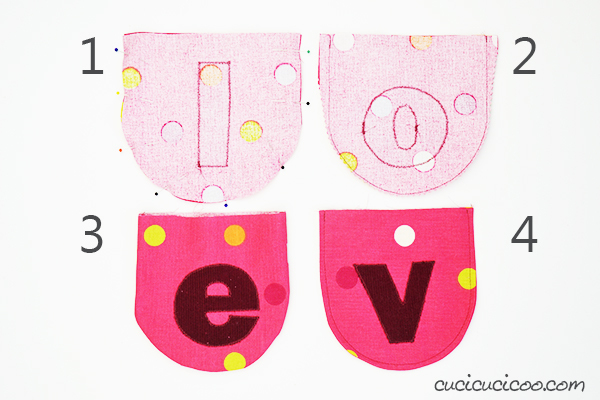 How much fabric exactly you need depends on what shape/size pennants you will make. Double fold bias tape. Any size is fine, but I prefer 12.5mm (½”) double fold. You can use storebought bias tape or make your own! 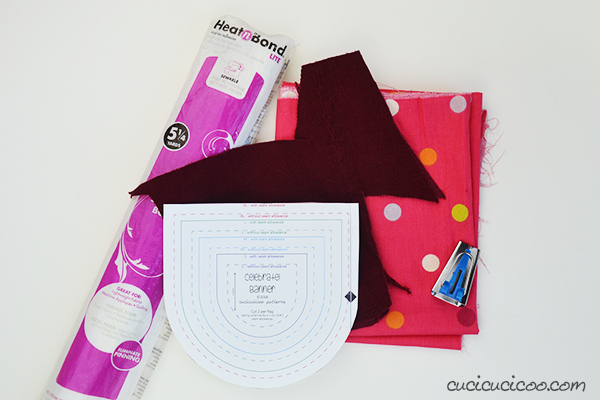 I highly suggest you use the continuous bias tape method that I explain in this sewing lesson so that you will have a lot of bias tape in the perfect color without having to piece together a bunch of separate strips. The exact amount you need depends on how long your banner will be. 1. Use the Celebrate! Banner pattern to cut out 12 flag shapes (6 pennants, front and back) or just draft your own flag pattern shape (#1 above). 2. 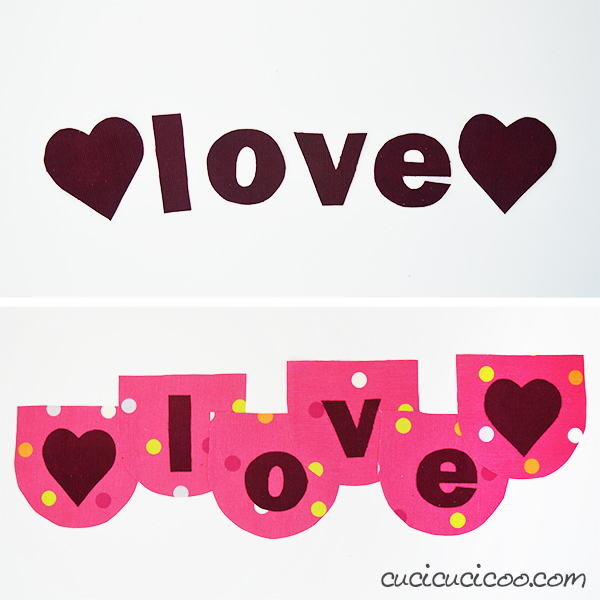 Trace the mirror image letters l – o – v – e and two heart shapes from the Celebrate! Banner pattern onto the paper side of Heat’n’Bond Lite*. If you’re not using the pattern, you can freehand them or trace letters from your computer screen. (See how I trace from a computer screen in this DIY Play Doh mat tutorial.) Just don’t forget to trace the letters as MIRROR IMAGES! 3. Iron the traced letters onto the back of the appliqué scrap fabric (here I’m using scraps of an old burgundy corduroy skirt that I refashioned into my daughter’s Pocket Fold Skirt). 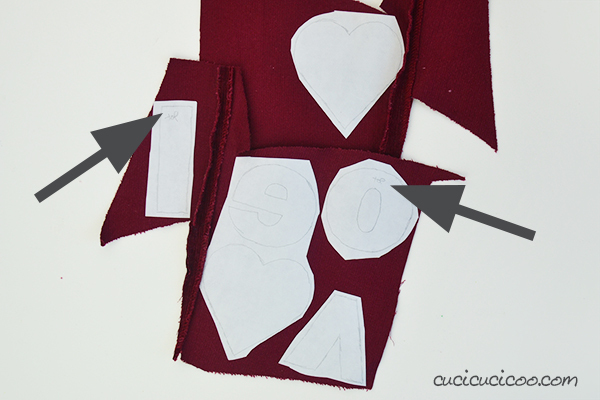 If necessary, cut around the letters/hearts to fit them onto small fabric scraps (#2 above). 4. Make bias tape, if you aren’t using storebought bias tape. 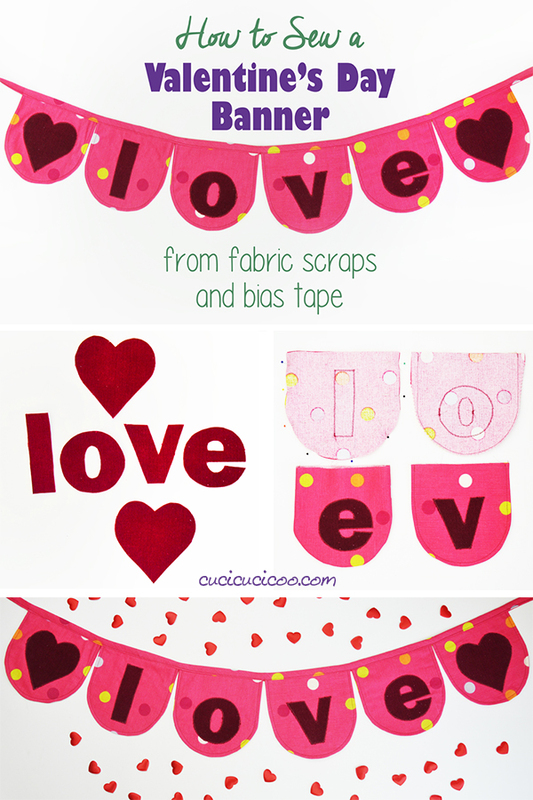 Find out how to make bias tape with a bias tape maker here or, even better, find out how to make tons of bias tape all at once with a special trick here. 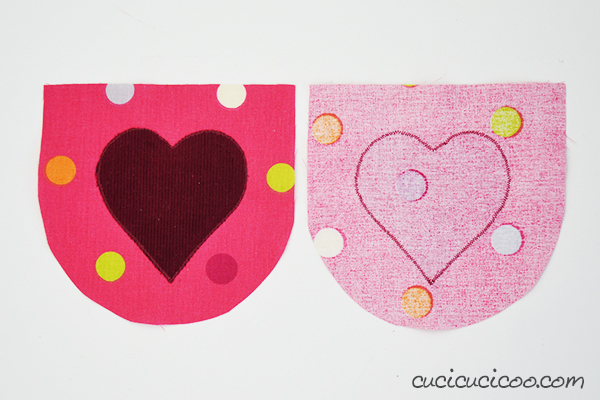 I used the same fabric as the pennants, but you can use a different fabric (#3 above). I highly suggest that you mark the top of the “l” and the “o”. It might not matter, but depending on your font, these letters might be slightly wider on the top or bottom, or on one side or the other. As you can see above, I wrote “top” at the top of those two letters. 5. 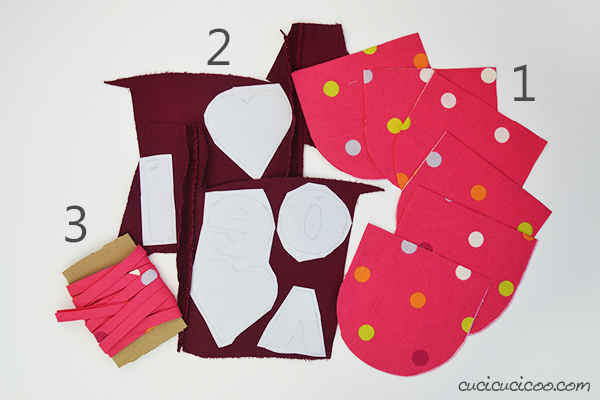 Cut out the appliqué shapes along the traced lines (top). 6. Peel off the paper backing on the appliqué shapes, center them on the right sides of six flag pieces, shiny side down, and iron them on (bottom). Remember to follow the instructions on the Heat’n’Bond Lite* package regarding ironing temperature and time. 7. 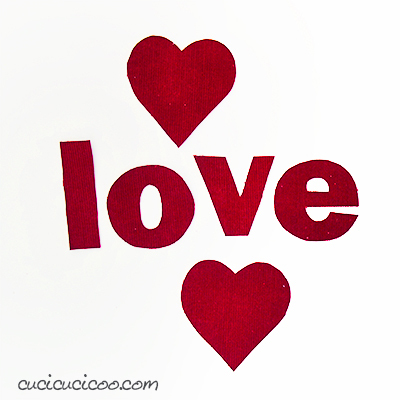 Zig zag stitch around the edges of each letter and heart. (Read my machine appliqué sewing lesson if you don’t have much or any experience with this technique.) Here you can see how it looks on the front and on the back of the individual flag pieces. 8. Put one appliqued piece on top of a non-appliqued piece, right sides facing, and pin all sides together except for the flat top (#1 above). 9. 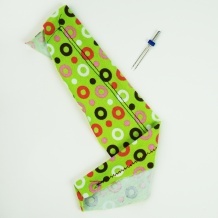 Sew along the pinned sides with a 1 cm (3/8″) seam allowance, then clip and notch the curves (#2 above. 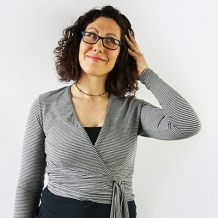 See my sewing lesson on turning and topstitching to find out more about clipping and notching.). 10. Turn the flag right side out, pushing the curves out completely with your finger from the inside (#3 above). 11. Iron flat, then topstitch close to the sewn edges (#4 above). 12. 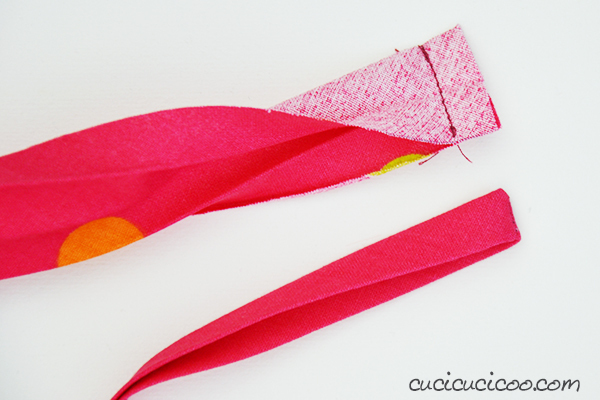 Cut the length of double fold bias tape that you’ll need. Calculate the number of flags by the top width of the flags and then add extra for hanging. I usually add about 70 cm (28″) per side. 13. Turn each end of the bias tape wrong side out along the center fold and pin it together. Then sew across the short edge with a 1 cm (3/8″) seam allowance (top). 14. Trim the fabric close to the seam, then turn the bias tape right side out again, folding the raw edges back inside and pushing the corner out with something pointed, like a chopstick or the tips of your fabric shears (bottom). 15. Fold the bias tape strip in half to find the center and mark it with a pin. 16. Slip the “v” flag inside the bias tape just to the right of the pin, so that the edge is against the pin. Pin it in place, then slip the “o” flag just to the left of the pin and pin in place. Make sure that the flag edges are right against the inside of the bias tape fold (shown above with the arrow). 17. Continue pinning each flag in order. 18. Sew down the length of bias tape, from one end to the other, close to the open edge. If you want, you can also use an adjustable bias binding foot. All you have to do now is decide where to hang it, or who to gift it to! This is a really great gift to mail to loved ones who live far away because it’s light and compact, so is easy to post. 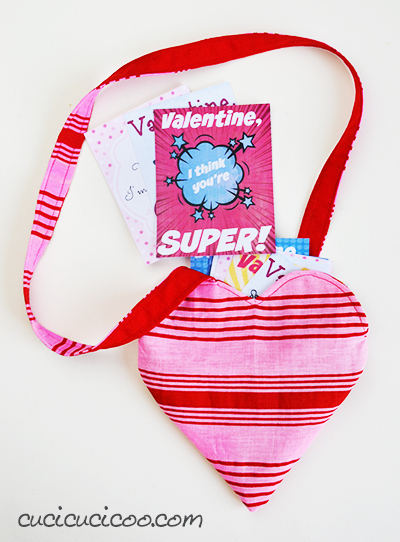 And it’s a wonderful way to remind them that we love and think about them despite geographical distance! 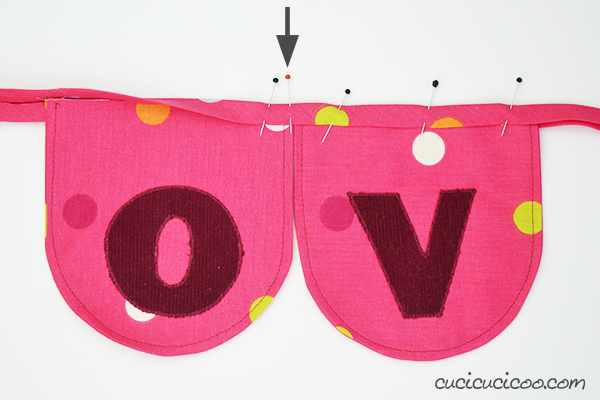 Don’t forget, if you loved this tutorial on how to sew a fabric Valentine’s Day banner from scraps, save it here on Pinterest! 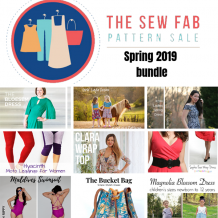 And while you’re at it, make sure you sign up for the Cucicucicoo Newsletter to get awesome sewing and crafting projects, free patterns and access to the members-only area of Cucicucicoo with dozens of free sewing patterns, craft templates and useful printables! Yay!